We have some absolutely stunning vividly colored chinese box turtles for sale at the best prices anywhere for this quality of animal. We offer chinese box turtles for sale as hatchlings, well started babies as well as yearlings. We recommend the well started baby chinese box turtle for sale over the more fragile chinese box turtle hatchlings. Our baby Chinese box turtle hatchlings for sale are currently eating meal worms dusted with vitamins as well as mazuri tortoise chow and a variety of veggies and greens. The Chinese box turtle species is the “crown jewel” of all box turtles and is most sought after by box turtle enthusiasts across the world. The “box turtle” gets its name from the ability to close it’s shell on both ends. They make great pet turtles and seem to be able to learn their owner’s voice and become quite personable depending on the amount of time spent with them. We do highly recommend the 6 month old well started baby chinese box turtles for sale and 1 year olds over the more fragile hatchlings they are available here. They are still babies but much easier to care for. They are omnivores that will eat both plant and animal matter, such as wax-worms, earthworms, snails, berries, fruits, and grasses. Our captive bred baby chinese box turtles for sale are ready to ship to you via UPS or FedEx Overnight in a heated or cooled, insulated box and come with our live arrival and full 7 day health guarantee. One shipping charge covers up to 4 tortoises or turtles for sale. At TortoiseTown, we are proud to have the largest selection of box turtles for sale online anywhere. We have everything from the common box turtle for sale, including the eastern box turtle, baby eastern box turtles for sale, adult eastern box turtle for sale, 3 toed box turtle, ornate box turtles including baby ornate box turtle for sale. Baby ornate box turtles are very similar to desert box turtles. We also have florida box turtles, gulf coast box turtles, chinese box turtle for sale and more. While the baby chinese box turtle is probably the most expensive, it is also the most rare. All of our baby box turtles for sale are 100% captive bred and are raised inside our baby turtle adoption facility. With a biologist on site, you can expect a health new pet box turtle for sale from tortoise town, shipped year round! Remember when searching for any tortoises for sale, including a new baby tortoise for sale, tortoise town is your source for the best tortoise for sale , baby tortoises for sale , baby turtles for sale, and adult turtles for sale of any turtle store anywhere including a huge aquatic turtles for sale section. If you are interested in tortoise care, please visit our care section. Looking for a baby Chinese box turtle for sale? Tortoise town has the nicest baby Chinese box turtles for sale online! Chinese box turtles are one of the most colorful and sought-after of all the species of captive-bred box turtles for sale. Considering a baby Chinese box turtle for sale? Or maybe a pair of baby Chinese box turtles for sale? Tortoise town has the nicest captive bred chinese box turtle stock in the USA. Baby Chinese box turtles are a fairly hardy species. A Chinese box turtle is known for having a curious personality and often follow their owners for a treat. Overall, Chinese box turtles are very easy to care for. When choosing a baby Chinese box turlte to purchase, we recommend a well-started baby Chinese box turtle. Well started baby box turtles are much easier to care for than fragile Chinese box turtle hatchlings for sale. Therefore, when choosing which age of baby Chinese box turtle for sale to purchase, we highly recommend a well-started baby over a hatchling. Adult Chinese box turtles are also available here at Tortoise Town. Our baby Chinese box turtle hatchlings for sale are currently eating mealworms dusted with vitamins. Also, we feed Mazuri tortoise chow to all of our box turtles for sale. Secondly, our box turtles are wide provided a variety of veggies and greens. Chinese box turtle species is the “crown jewel” of all box turtles. Chinese are the most sought after by box turtle enthusiasts across the world. The “box turtle” gets its name from the ability to close its shell on both ends. Mature Chinese boxies make great pet turtles for sale and seem to be able to learn their owner’s voice and become quite personable depending on the amount of time spent with them. Most noteworthy, these inquisitive little chelonians also called “snake eating turtles”. In addition, Chinese box turtles are also called Yellow Margined box turtles, and Golden-headed box turtles. Because CBT is native to the sub-tropical and temperate climates of China, Taiwan, and Japan. Chinese Boxies have a unique hinge on their plastron. Having a hinged plastron allows box turtles to withdraw their arms, legs, and head fully. They’re able to load completely into their shells and seal up like a box. Interestingly, these animals can stay in this position for hours. Lastly, for size, these turtles reach a shell size of 5-10 inches long. Most Chinese box turtles are around 6-7″ at full maturity. Some of them can get larger but that is uncommon. The larger the enclosure the better! Babies as well as juveniles can be kept in glass 20-gallon aquariums but can outgrow them. A long-term solution is you are using an aquarium is at least a 55 gallon. Keep in mind that some box turtles can spend a significant amount of time trying to “walk through” the glass and therefore blocking off 3 sides is recommended. Leaving the front open for viewing is normally fine and common. When using aquariums for adults, they must be large not only to offer the appropriate space needed for daily exercise. Also, they require it for enrichment via foraging behaviors but also to allow for better air circulation. Also, using a 40-gallon aquarium or larger is suitable for adults. Because building custom enclosures is a viable option and have become quite popular. Lastly, build to 4 feet wide by 4 feet long and 12 inch high enclosures are used to house two (female and female or male and female) box turtles comfortably. In closing, since these animals are semi-aquatic, 25-50% of the cage should be a shallow water area. At the very least, a large container for swimming that the box turtle can easily enter and exit for swimming is required. We do highly recommend the 6-month-old well started baby Chinese box turtles for sale and 1-year-olds over the more fragile hatchlings they are available here. They are still babies but much easier to care for. They are omnivores that will eat both plant and animal matter. Some foods include wax-worms, earthworms, snails, berries, fruits, and grasses. Our captive bred baby Chinese box turtles for sale are ready to ship to you via UPS or FedEx Overnight. Because we ship year-round, we use heated or cooled, insulated boxes. Most importantly, all of our reptiles for sale come with our live arrival and full 7-day health guarantee. One shipping charge covers up to 4 tortoise for sale, aquatic turtles or turtles for sale. Also, if you’re looking for other reptiles for sale, or turtles for sale, consider CB reptile! I just received a pair of beautiful 6 month old well started chinese box turtles from tortoise town. 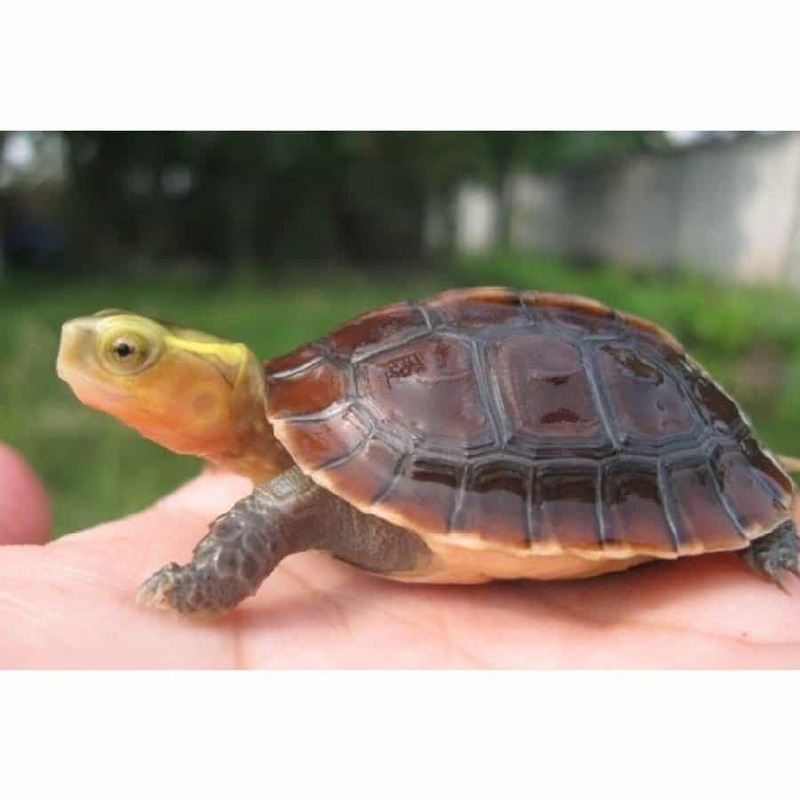 I am glad I chose tortoise town as my chinese box turtle breeder when searching for a chinese box turtle for sale as they offered me plenty of free care information and have fantastic customer service via phone and email. I would highly recommend tortoise town to anyone looking to buy a baby chinese box turtle for sale online because they are the best!